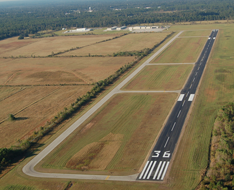 The Picayune Municipal Airport (MJD) is located two miles southeast of the City of Picayune in Pearl River County, and is accessible via Interstate 59. The Airport is approximately 50-miles North of New Orleans, Louisiana and a 40-minute drive to the Mississippi Gulf Coast. The Airport has one North/South runway 18/36, is 5000-feet long with a parallel taxiway and has pilot controlled lighting with RNAV GPS approaches to runway for 18/36. There are four FBOs on the airport which include aircraft maintenance, flight instruction, aircraft cleaning and parts sales. Also available at the airport is self service fuel (100LL and Jet A), two car rental companies, and cab service. To secure the facility the Picayune Airport has security fencing, surveillance cameras and 24-hour access to the terminal building.